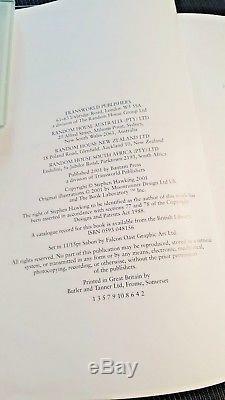 I have been given the task to sell this entire prestigious Stephen W. Listed are two books, one of which has an incredibly rare Stephen W. Hawking signature and the other book holding Stephen W.
Hawking's rare thumb print. The last item is a personal University of Cambridge letter from Stephen W. Hawking's written on behalf of his assistant. The letter also comes with a photograph of Professor Hawking and his signature stamped on the back of the photo. 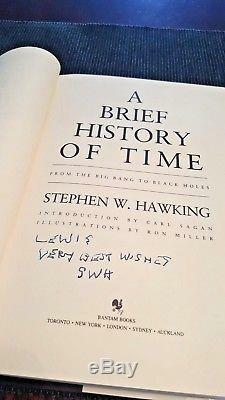 The entire collection displayed here is as rare as it gets with obtaining anything remotely close to a signature of Stephen W.
Due to Professor Hawking's condition, he didn't sign many items and throughout the years his signature has changed immensely, with each signature being very different from the other which is why you won't see many signatures alike. Stephen then went to using his thumb print as an alternative which was only handed out to close relatives/assistants. Hawking would also receive thousands of letters in which he would reply back with a picture of himself with his name "stamped" in the back as well as a letter from his assistant. Below are the descriptions of each item. 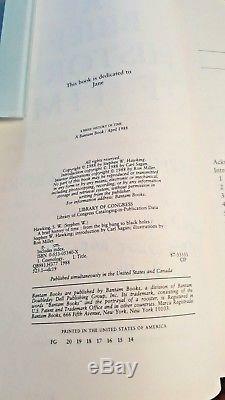 "A Brief History of Time 1st Edition Book" signed by Stephen W. This book was acquired from the estate library of the Lewis Stetson Allen family. Lewis Stetson was the great grandson of John Batterson Stetson, creator of the iconic Stetson hat. 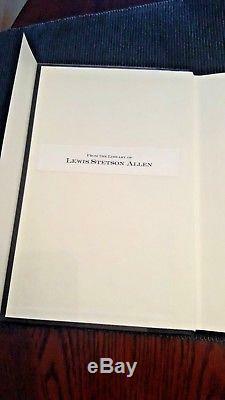 This book was signed and delivered personally to Mr. Lewis Stetson Allen from Stephen Hawking's personal assistant. It was very common for prominent figures to have personal libraries with their stamp inside the book. Lewis Allen Stetson was a renowned banker, businessman, and philanthropist who was well-connected, and active around the world. 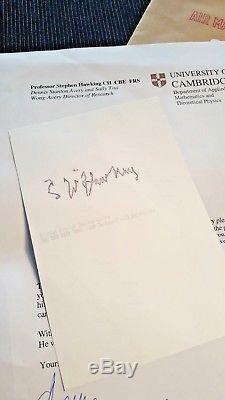 This is not a "stamp" of Stephen W. Hawking or signed on behalf of Stephen's wife or assistant; this is signed by Stephen himself. This is the 13th printing of the First Edition of his classic "A Brief History of Time". 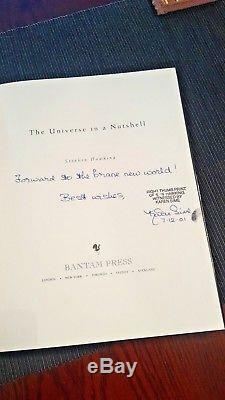 "The Universe in a Nutshell" thumb print from Stephen W. This book was acquired from a couple who were well connected with Stephen Hawking through Aunt Sandy who was employed by Professor Hawking as one of his head carers and worked with him in his home (original letter of provenance will come with this book revealing the full name). 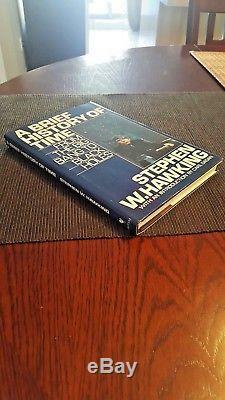 Sandy had two of these books thumb printed in Professor Hawking's home for her nephews, as witnessed by Karen Sime, Professor Hawking's personal assistant at the time. A thumb print of Stephen Hawking was incredibly rare to obtain as he didn't do it for just anyone. A personal photo with Stephen Hawking of Sandy will be added to the book. "University of Cambridge" Letter and Photograph Signed Stamped from Stephen W. This letter is from the personal office of Professor Stephen W. Hawking at the University of Cambridge. Director of Research at the Department of Applied Mathematics and Theoretical Physics (DAMTP) and Founder of the Centre for Theoretical Cosmology (CTC) at the University of Cambridge. For over thirty years he has lead the General Relativity group in DAMTP and he has been Principal Investigator of the COSMOS National Cosmology Supercomputer since 1997. Stephen is also the Emeritus Lucasian Professor for Cambridge, a prestigious title that boasts Isaac Newton, Paul Dirac and Charles Babbage amongst its previous holders. During his time at Cambridge Professor Hawking has written a large number of publications. While at the University of Cambridge, Professor Hawking would receive thousands of letters. Because Professor Hawking wasn't able to reply personally, he would ask his assistant (Anthea Bain) to send letters on behalf of him. All the items were described by Stan with as much details as he could provide. Any further questions will require a few days for receipt as I would need to call him and his son to get more information. 10% of the auctions ending price will go to. The charity cannot change and those who want to donate to a different ALS non-profit organization can do so on their own. The item "Stephen Hawking Signed Book Autograph Signature Thumb Print Stamp 1st Edition UK" is in sale since Thursday, May 3, 2018. This item is in the category "Entertainment Memorabilia\Autographs-Original\Other Original Autographs". The seller is "kefkasdomain" and is located in Richmond Hill, Ontario. This item can be shipped worldwide.